Sometimes you just need a long weekend to get away from it all, a quick trip to recharge your batteries. My little secret, if that I don't count out Walt Disney World when I just want to run away. While many Disney fans are always working on those long week plus family vacation, I'm happy to jet down an get a quick fix in whenever I can. Because the quick getaway is often all about working with money you have on hand rather than saving, sometimes, I don't even go to a Theme Park. Shocking - I know! 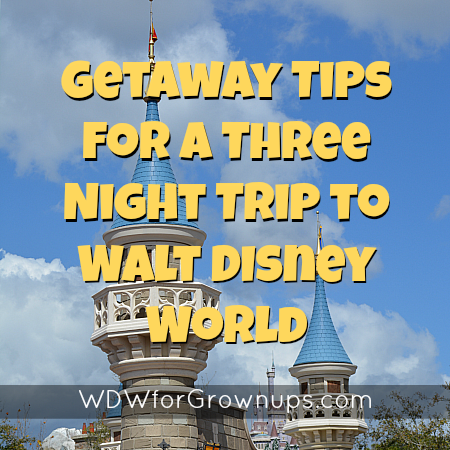 Here are just a few of my getaway tips for a three night trip. Leave as early in the morning as possible on your departure day, and later in the day when you return. Careful scheduling of your flights should give you at least two and a half full days of vacation to enjoy. Travel light by just packing a carry-on bag. If you'll be skipping the Parks (which I often do on a short trip) be sure to splurge a little on your hotel room. Pick a resort that offers an atmosphere you want to hang out in. Then sleep in, hang out, and enjoy it. Luxuriate by spending at least half a day hanging around your Resort pool, going to the spa for a treatment, or having an in-room massage. Some of the Deluxe Resort Pool Bars also offer private dining that can be delivered right to your chaise lounge. So go ahead - order another Pina CoLava. You don't have anywhere else to be. Spend a day at Downtown Disney/Disney Springs, where leisure rules. See a movie, embark on an amphicar, ride in a balloon, go bowling at Splitsville, catch a showing of Cirque du Soleil's La Nouba, or maybe a concert at the House of Blues. There are so many fun things to do and see already, no ticket required. Go hotel hopping! From your Disney Hotel take a bus to the Magic Kingdom and hop aboard the monorail for a trip around the Seven Seas Lagoon. Spend the day discovering the unique themes of Disney's Contemporary, Polynesian Village, and Grand Floridian Resorts. It's a fantastic way to figure out where you'll be staying on your Next Walt Disney World trip. When you get back to the Magic Kingdom, why not hop a boat and visit Disney's Wilderness Lodge or Fort Wilderness Resort Campground. 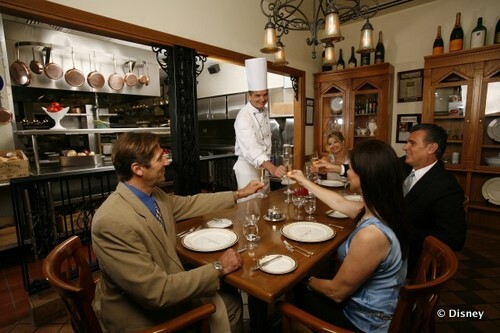 Book an exceptional meal. For the elegant experience of a lifetime book a table at the Grand Floridian's Victoria and Alberts, this five diamond restaurant is widely known as one of the very best in Florida. If that's not quite in your budget, consider trying Disney's Hoop-Dee-Doo Musical Revue or the Spirit of Aloha Dinner Show. Just can't make the trip without some Park time? No worries! Pick a park to enjoy and spend an entire day there with no hopping somewhere else. Really take your time and notice some of those special details that you might not have caught racing from ride to ride when you focus on park-hopping. Experience some of the things you've never done before. Check-out at the Walt Disney World Resort hotels is at 11:00am. 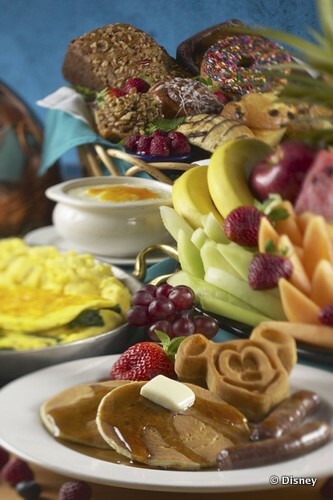 Sleep in, pack up, and then enjoy a full table service breakfast or brunch at one of the Resort Hotels. Then take a walk around the grounds before catching that Magical Express back. While three nights may be short, Walt Disney World has plenty to of activities to enjoy booth in and out of the Park environment to refresh and recharge your spirit. Have you ever taken a quick weekend trip to Disney? What are your quick trip tips? Since we live in Florida, we can take advantage of short trips, especially using an annual pass. We love it. We arrive early on day one and leave as late as possible on the last day. just get up and go !!!! It was the best trip we ever had !!! !